Economic theories often focus on the decisions of individuals, despite the fact that many important commercial, political and social decisions are made by groups of people. How do individuals and groups differ in their decision-making processes and what are the wider consequences of this group interaction? Michal Bauer (CERGE-EI) tackles this issue through his research in the fields of development microeconomics, experimental economics and behavioral economics. His recent work has focused on the causes and consequences of group conflict, discrimination and the formation of preferences. 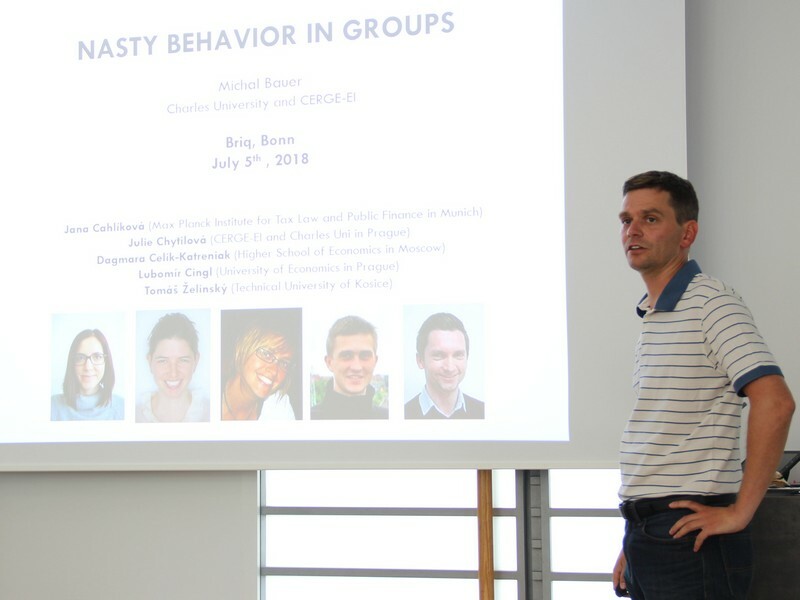 In July he presented two lectures at briq in which he discussed measuring attention in the field to better understand discrimination and poverty, and the sources of “nasty behavior” in groups. The presentation covered a recent field experiment conducted in Uganda and Slovakia in order to test selfish and anti-social behavior of individuals and groups. Consistent with previous research, it was found that groups are much less likely to display cooperative behavior than individuals. The study also revealed that groups are more likely to also act anti-socially, by punishing outsiders even when it is costly to themselves. The group context also made people much more aggressively competitive. The greater nastiness of groups arises almost exclusively due to the psychological effect of being a part of a group on individual preferences, rather than due to deliberation and joint decision-making among group members. Strikingly similar patterns on both continents suggest that the elevation of the dark side of human social motivations is a deeply rooted behavioral response when individuals are banded in a group. The findings have implications for economic theory and can help explain the prevalence of self-destructive group conflicts.